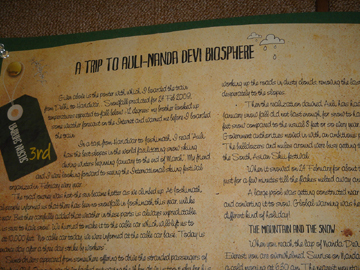 WWF(India) along with Lonely Planet Magazine (India) organized a travelogue contest in 2010. The contest was open to travelogues written about the Himalayan region. The writings brought out what ails our mountain ecosystems which are also some of the most popular tourist destinations. The first prize of the Ecotrail contest went to Ms. Katherine Joanna Johnson from UK. An architect, she is currently pursuing her Masters in Architecture from the London Metropolitan University. When the cloudburst struck Ladakh in August 2010, she happened to be there and almost lost her life while trying to get back to safe ground. Her journey taught her not only to value life more but also a lot about the environmental damage that has already been caused to this fragile region. She stayed back and provided her architectural knowledge to the SEEDS India team to design buildings that are sustainable and less vulnerable to disasters. She has been working with bamboo and mud, as sustainable construction material in the Almora region. The second prize went to Ms. Indu Balachandran, a travel and humour columnist based in Chennai. Travel is her greatest passion, and she reviews eco-friendly hotels all over India for an Indo-Danish website, ‘traveltocare.com’. The awesome majesty of the Himalayas elevates her entire spirit and she is of the opinion that no travel experience in the world beats that feeling! The third prize went to Mr. Sohail Jafferi, an indeprendent documentary filmmaker based in Mumbai. He went along with his cinematographer friend to Kinnaur to capture its natural splendor of which he had heard so much. What he saw there surpassed his expectations. The mega hydel projects in the regions have disturbed him greatly, so much so that an ambitious documentary on this issue is under production right now! The third prize also went to Susan Sharma, who writes “As we moved down I collected a few branches of golden oak leaves. 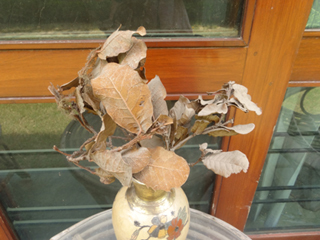 The trees marked with the "death warrants" continue to haunt me when I look at these leaves dried but golden, weeping silently in my vase.” When she is not up there climbing mountains, she works as an Information System specialist in Gurgaon. She runs an online nature club called ‘IndianWildlifeClub.com’, leading people to the cause of nature conservation. The Himalayas to her is nature at its most majestic and most vulnerable. The Blog was written based on my visit to Auli in February 2009. I also did a search on the Internet to find out the current position of the Auli ski slopes. Here are some of the writings I found. The world's highest man-made lake is at Auli, right next to the private hotel, Clifftop Club. The government has developed this in view of creating artificial snow on the new ski slopes in the event of low snow fall. The water from this lake will be used to feed the snow guns stationed along the ski slopes and thus provide a good skiing surface and exend the ski season. "I was happy to see that the State Government had taken a stand on implementing "the rule of law", howsoever much strength the law-breaker may wield. A large number of poor locals, who happily offered their land for a good cause - extension of ski-resort - also came with folded hands for payment of compensation for their land. Government officials promised prompt payment. I am happy that the State Government is reported to have already deposited Rs 6 Crores with the authorities responsible for payment of compensation. Villagers argued that, on the one hand, the poor man's land was being acquired and, on the other hand, the rich hotelier was being allowed to encroach upon government land. To escape such embarrassments, I requested the sports minister to prepare a long term plan and bisect the entire Auli formation into residential and ski zones. The minister appreciated the suggestion and I hope for the best as soon as possible." "To lay an international standard ski-slope an Austrian expert was hired and the contract for constructing the slope was given to a Kashmir company called Space Age. The company removed the high-altitude grass that grew on the slope, exposing the layer of soil underneath. Such high Alpine slopes (Auli is at 10,000 feet) are considered highly environ-mentally sensitive and it is forbidden to interfere with them in Europe and other countries as well. Here if one digs and removes even a little bit of grass cover, that wound starts spreading and it becomes very difficult to contain the erosion. However, after the grass cover was removed and the soil layer underneath exposed in the summer of 2008, rains started and began washing the soil below in torrents right down to villages and Joshimath town, 15 kilometres below. Water and soil filled homes of the Joshimath town people and the municipality had to employ workers to clean it from rooms. With soil washed down, the ski-slope was left with ditches and rifts, some 10 feet deep. 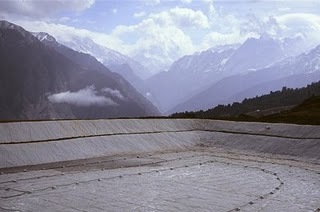 For creating a lake to make artificial snow, water was brought through pipes from some 10 kilometres up the mountain. The contract for putting up a snow-making machine and laying pipes along the slope was given to an Italian company called Snow Star. Last winter the machine was tested to see if it made snow and managed to spread it along the slope. It was supposed to do so when the temperature in Auli was two degrees above zero. The Auli temperature at that time was lower than that. But the machine failed to make snow. Its pipes spewed some white stuff up in the air but there was no snow on the ground, only water!" Are we going to do something to stop wanton destruction of our mountainscapes?